Six months ago, I wrote about the Russian weather satellite Elektro-L, which has more than two years of successful experience in the geostationary orbit. We collected beautiful photos through social media (including a page at Vkontakte, the Russian version of Facebook.) I promised that I would return here to share the materials that we collected. I think it's time to deliver on the promise. 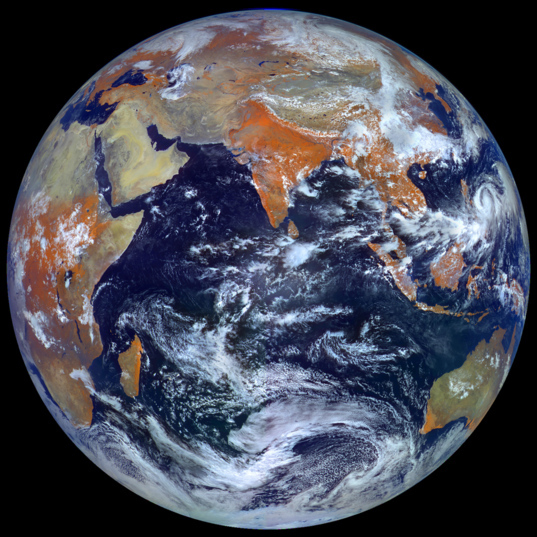 Earth as viewed by the Russian weather satellite Elektro-L, which is in a geostationary orbit at a distance of 36,000 kilometers, on September 26, 2012. A higher resolution version is available on GigaPan. The Elektro-L spacecraft was built by NPO Lavochkin (by the way, they now also have their own Vkontakte page). It launched on a Zenit rocket with a Fregat upper stage two and a half years ago. 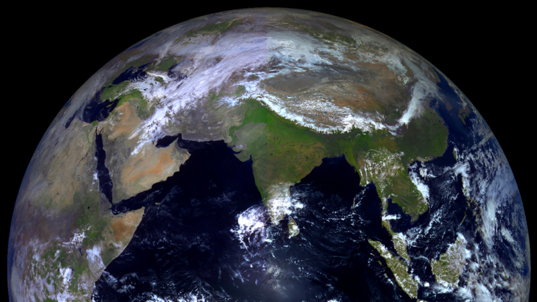 Elektro-L creates an image of the Earth at a resolution of 1 kilometer per pixel every 30 minutes. Images are captured ​​in ten spectral bands, two of which are visible: green and blue, followed by near-infrared, and then seven different medium- and far-infrared wavelengths. The latter observations allow meteorologists to observe the movement of clouds at different altitudes. But the first three channels -- blue through near-infrared -- create splendidly beautiful photographs. Typhoon Jelawat as viewed by the Russian weather satellite Elektro-L, in mid-September 2012. The Indian Ocean as viewed by the Russian weather satellite Elektro-L, at a geostationary orbit 36,000 kilometers from Earth. 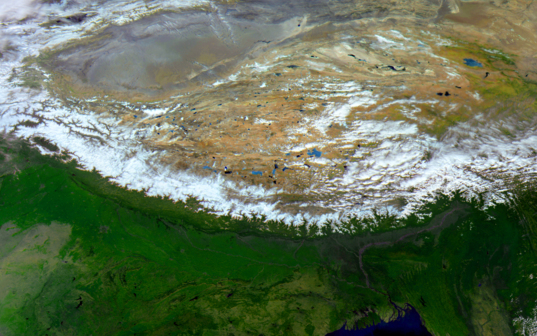 The Himalayas as viewed by the Russian weather satellite Elektro-L, in a geostationary orbit 36,000 kilometers from Earth. Because an infrared image is substituted for a red one, color images composed of infrared, green, and blue Elektro-L frames look unusual: what should be green appears orange. [This is because chlorophyll, the green pigment in plant life, is strongly reflective in near-infrared wavelengths.] To make plants appear green requires processing in Photoshop. I think it is a big omission that neither Roscosmos nor RosHydromet have not made any effort to share this beauty with people. Fortunately, almost all the pictures are in the public domain on the FTP-server of the Space Agency - Research Center for Earth Operative Monitoring (NTs OMZ). Taking advantage of their openness of information, I decided to show by personal example what I think the press service of the Russian Space Agency could be doing. Other users who are involved in the work on the transformation of science into beauty may be guided by other motives, but together we have done good things with the photos. For example SayJabberwocky created videos with full disk of the Earth. He then refined the processing procedure and began to chose individual fragments. Weather patterns over Europe as viewed by the Russian geostationary satellite Elektro-L. The idea of the next clip we pulled from the European Southern Observatory. A press image of theirs showed how the illumination of the Earth varies depending on the tilt of Earth's axis. This Elektro-L video was created by an amateur. This movie could be used in schools for natural history lessons, to show why the summer is warm and the winter is cold, and to explain polar night and day. This animation shows weather patterns over multiple seasons on Earth as viewed by the Russian Elektro-L weather satellite, in a geostationary orbit 36,000 kilometers from Earth. Other amateurs chose a different path. They wrote a program for everyone to be able to display the latest Elektro-L images on their desktop, with automatic updates. Now you can watch global weather virtually, on your desktop. How to do this can be found here. I want to acknowledge that the management and technical specialists at NTs OMZ were willing to help us when we approached them with requests. We asked them to show the Moon. The normal Elektro-L image processing software pipeline cuts off everything beyond Earth's disk; the specialists had to manually dig into the raw images to get a suitable picture and put it on the server. Earth and its moon as viewed by the Russian weather satellite Elektro-L, which is in a geostationary orbit 36,000 kilometers from Earth. We asked them to increase the size of previews from 800 to 1080, so as to better fit across a computer monitor, and they did. We asked them to lay out a full-length color image that was not in the archive, to put it in a folder along with a preview that facilitates the creation of HD-video, and they did. We give them a nod for their helpful collaboration with space enthusiasts. Typhoon Jelawat viewed by the Russian geostationary weather satellite Elektro-L in September 2012. A more detailed view of the eye of the storm is available here. Wanting to expand the audience that would enjoy such a sight, I contacted a variety of network media, offering the images. RIA-Novosti immediately responded. Their science journalist Ilya Ferapontov supported my work, and thanks to him, Elektro-L was repeatedly published on their RIA site. Ilya, in fact, was the only journalist who supported our campaign "Making Roscosmos Kinder," for which I thank him. Maybe there was someone else, but, alas, I do not know any. I've seen publications on the subject, which took place only after the RIA-Novosti reported it. We asked the Federal Space Agency to speed up the frequency of Elektro-L image acquisition at the time of the solar eclipse in Australia on May 10. And, all of a sudden, the Federal Space Agency agreed! The newspaper "Troitsky Variant - Science" published an article about this story. Animation of the May 10, 2013 solar eclipse imaged by the Russian Elektro-L weather satellite. Here is an animation of typhoon Haruna, which brought such devastation to Madagascar that even Russian media wrote about it, and they found our processed images very handy. This animation was was published by RIA-Novosti and Gazeta.ru. 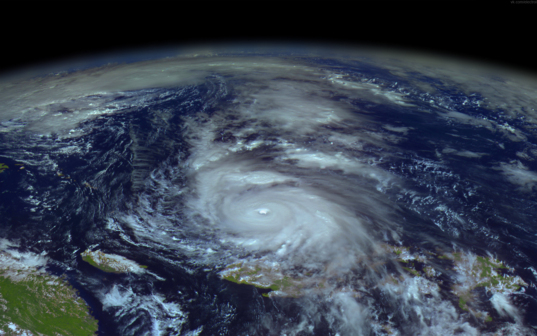 Animated view of a tropical typhoon from the Russian Elektro-L geostationary weather satellite. 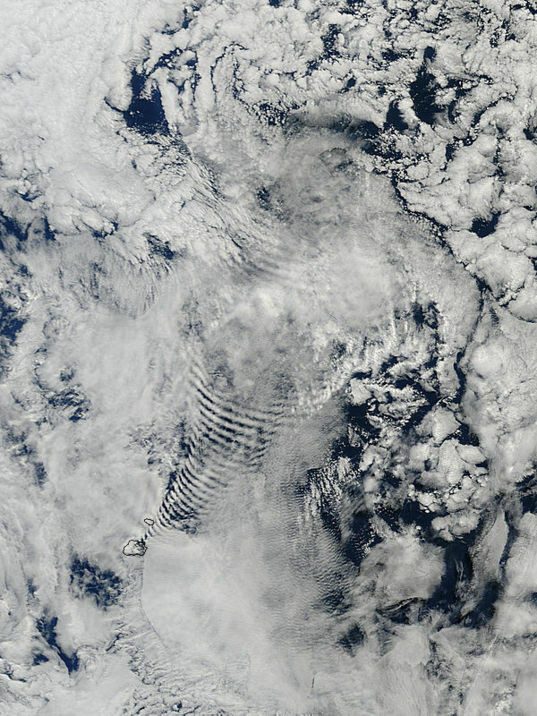 This one reminded me of one shot by a NASA satellite: Their Terra satellite took a photo of interesting clouds over Prince Edward Island, south-east of the Cape of Good Hope. These unusual cloud ripples form over the mountain on the island. A similar wave forms when you get when you let a thin layer of water on a flat surface, and then put a small stone in the stream. These clouds over the Prince Edward Islands, south-east of the Cape of Good Hope, were imaged by the NASA MODIS Terra satellite. The ripples form as the air travels over mountains on the islands. On the NTs OMZ server, I found Elektro-L pictures of this place at the right time and was able to get a series of images showing the cloud development. A larger view of these clouds is interesting. Lenta.Ru also published the photos. Animation of clouds as viewed by the Russian weather satellite Elektro-L. This animation is made up of 17 frames taken by the satellite from 8:30 to 16:30 Moscow time on 26 March 2013 at 1 frame per 30 minutes. A view of these came clouds by the NASA MODIS Terra satellite is available here. These images have been picked up abroad. The animation was included in a story on Universe Today. From there, it was reprinted by some Czech news site. Universe Today published a video of the solar eclipse of May 10, 2013 as seen by Elektro-L.
Over the past six months there was more reason to look at the Earth through the eyes of Elektro-L: dust storms in Saudi Arabia and the Sahara, smoke from forest fires in Singapore, unusual clouds from NASA...I'm just talking about those for which I had time to deal with press releases, and newsletters. If one makes contact with the media, it is much more likely that these images will be published. People love beautiful pictures, and the press need high-quality and relevant content. It shows off what our national space program can do. The media relations team at NASA creates interesting, informative and beautiful materials, which spread through media, social networks, and Internet searches. I see no reasonable explanation for why Roscosmos does not do the same thing! 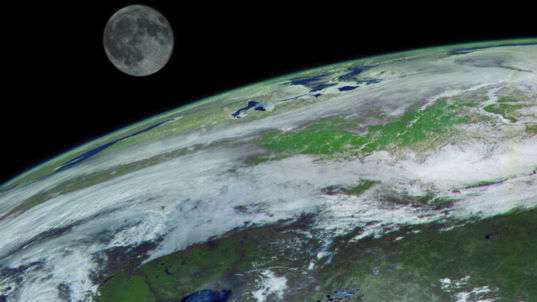 Earth as viewed by the geostationary Russian weather satellite Elektro-L.
Molodets, Vitaliy! Thank you! The images appear so perfect and precise. Can you explain the rumor that the Russian meteorological service was slow in officially 'accepting control' of the satellite because of some technical problem? Might that be a reason for official reluctance for open publicity campaigns? It sure seems like any problems, if they existed at all, have been overcome. Yes, the satellite has a problem on medium and far-infrared scanners. The constructors promise to fix this problem on the next spacecraft "Elektro-L Two". 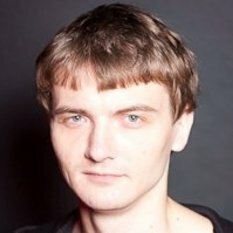 Spaciba Vitaly - Great article. I see that Elektro-L;s orbital slot is near 76.1 degrees East longitude (as is apparent from your very first picture). I find it interesting that Russian geostationary spacecraft are launched on the Zenit rocket, with Fregat upper stage. As you probably know, many commercial telecom geostationary satellites are launched on the Proton rocket (with Breeze M upper stage). Great images and animations! Wow... This is awesome stuff. The animations are great and the full disk rotation movie is especially impressive. 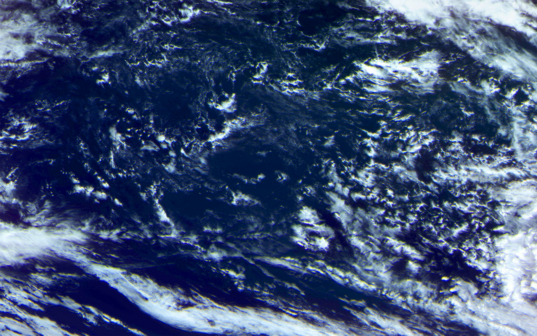 Are the full disk images mosaics of many frames or is a global image simply one very big image from the satellite? OH WOW! Fantastic work and images! Thank you! Perhaps you could get a media position at the space agency and do this work or maybe do this as a contractor to them. Bob, now I'm im Russian space private company Dauria Aerospace - it's best place for me. Roskosmos is very the bureaucratized.